Graham Worthington, Chief Executive of the Pennaf Housing Group, has retired after 22 years working to provide quality affordable homes across the region. Pennaf, which includes Clwyd Alyn Housing Association, manages over 5,700 homes across North and Mid Wales from the Isle of Anglesey, Conwy, Denbighshire and Flintshire to the Wrexham and Powys County areas. “I first started working in the sector in 1974 and for the last 23 years have worked for the Pennaf Group. I have always been passionate about the need to provide good quality affordable housing and it has been a privilege to work with dedicated staff and Board Members over the years who have helped to achieve this. “I’m confident that the Pennaf Group is in safe hands going forward and will continue to thrive, working in partnership with local authorities to meet the needs of communities across the region. 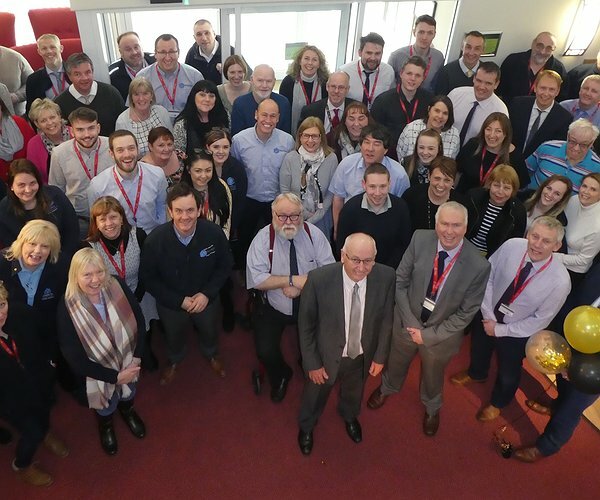 A retirement presentation party was recently attended by staff from across the Group when Mr Worthington thanked staff for their commitment as well as their kind wishes on his retirement. “It has been a pleasure and an honour to have worked with an amazing group of people who are doing a fantastic job for families in need across North Wales,” added Mr Worthington.